To Cite: Salehi-Vaziri M, Sadeghi F, Almasi Hashiani A, Gholami Fesharaki M, Alavian S M. Hepatitis B Virus Infection in the General Population of Iran: An Updated Systematic Review and Meta-Analysis, Hepat Mon. 2016 ; 16(4):e35577. doi: 10.5812/hepatmon.35577. Context: The hepatitis B virus (HBV) is a major global public health problem, affecting more than 2 billion people worldwide. Accurate and updated data on HBV prevalence is important for further planning to control the infection. The aim of this study was to update the prevalence estimate of HBV infection in the general population of Iran. Evidence Acquisition: A systematic review was done for data on the prevalence of HBV infection in the general Iranian population published between Jan. 1, 1990, and Jan. 1, 2016, in both international and national databases, including PubMed, Scopus, Web of Science, Scientific Information Database, IranMedex, and Magiran. 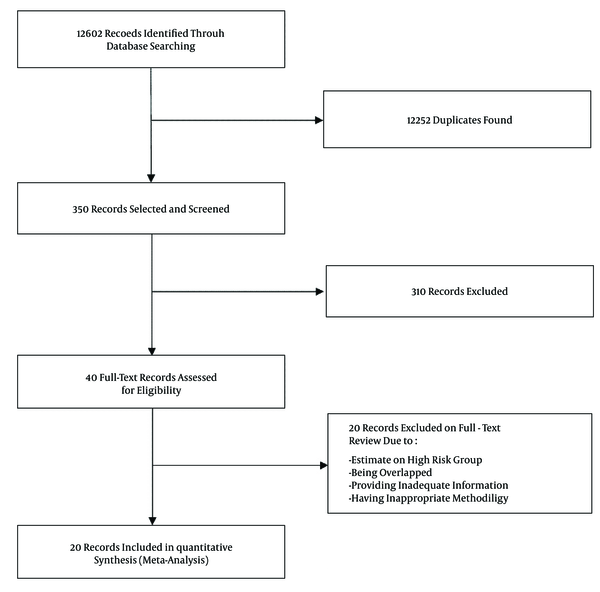 All papers with clearly described time and location of the study, proper sampling strategies, and proper analysis methods were included in the present study. Data were extracted by two independent reviewers. Prevalence of HBV infection with a 95% confidence interval (CI) was calculated using Stata software, version 13. Results: The polled estimated prevalence of HBV infection in the general population of Iran was 2.2 % (95% CI: 1.9% - 2.6%). The highest prevalence of HBV infection (8.9%, 95% CI: 7.6% - 10.2%) was reported from Golestan province, and the lowest prevalence (0.7%, 95% CI: 0.4% - 1.1%) was seen in Kermanshah province. The prevalence of HBV infection was estimated at 3% (95% CI: 2.2% - 3.8%) for Iranian males and 1.7% (95% CI: 1.2% - 2.3%) for Iranian females. The prevalence of HBV infection in the general population of Iran was 2.9% (95% CI: 2.5% - 3.4%) before 2010 and 1.3% (95% CI: 0.9% - 1.7%) after 2010. Conclusions: In total, Iran was classified within the low–intermediate HBV prevalence areas (2% - 4%), while according to recent data (after 2010), Iran was classified within the low HBV prevalence areas (< 2%), indicating that preventive measures conducted in Iran have been effective. The Hepatitis B virus (HBV) is a major global public health problem affecting more than 2 billion people throughout the world (1). Despite the availability of a highly effective vaccine against HBV, 350 million people are estimated to be HBV chronic carriers worldwide (2, 3). People chronically infected with HBV are at increased risk of developing HBV-related liver diseases, including hepatic cirrhosis and hepatocellular carcinoma (4, 5). The estimated worldwide mortality is more than 780,000 deaths annually (6). The frequency of HBV infection varies throughout the world (3, 7). There are high-prevalence areas where > 8% of the population is positive for the hepatitis B surface antigen (HbsAg); intermediate-prevalence areas in which 2% -8% of the population is HBsAg positive and low-prevalence areas in which < 2% of the population is HBsAg positive (7, 8). However, because there are regions very close to low-prevalence areas and also close to high-prevalence areas, it has been suggested that splitting the intermediate category into low-intermediate-prevalence (2% - 4.99%) and high-intermediate-prevalence areas (5% - 7.99%) could better reflect regional differences and their importance (3, 9). According to a recent study on the global epidemiology of HBV infection, Iran is classified within the low-intermediate-prevalence areas (3). The overall prevalence of HBV infection in Iran was 1.7% in the 1990s (10, 11). However, other regional studies in various provinces of Iran showed HBV prevalence more than 1.7% in the last decade (12-14). To decrease HBV carriers in the community, using vaccination is one of the most beneficial strategies in reducing the frequency of HBV infection (15). Accurate and updated knowledge of the prevalence of HBV infection is necessary to assess the impact of prevention and control measurements, including vaccination programs, and also for bringing up to date the estimates of disease burden (9). However, only two systematic reviews have estimated the prevalence of HBV infection in the general population of Iran: the study by Alavian et al. (16), covering studies from seven provinces from 2001 to 2007, and the study by Poorolajal et al. (17), covering studies from three provinces from 1989 to 2005. Therefore, there are no up-to-date national systematic reviews reporting HBV seroprevalence in the general population of Iran. The present study was conducted to make an updated estimate of the prevalence of HBV infection in Iran by a systematic review of peer-reviewed publications representing HBV seroprevalence in the general population of different provinces for which epidemiological information was available. 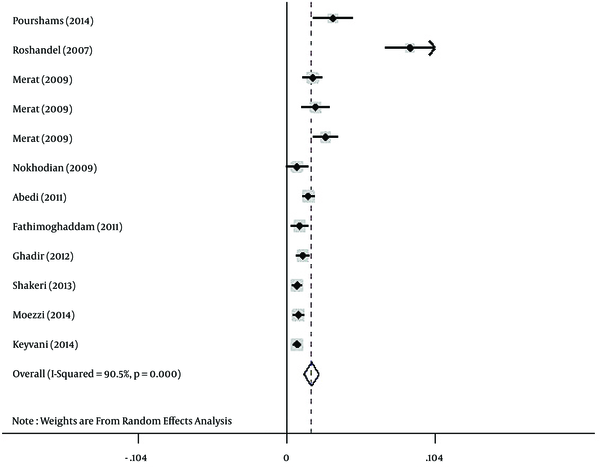 The present systematic review and meta-analysis was performed according to the criteria of the PRISMA guidelines (18). A systematic review on literature published between January 1, 1990, and January 1, 2016, was performed to find scientific papers reporting the prevalence of HBV infection (by detection of the HBsAg in samples) in the general Iranian population. To identify articles, international databases (PubMed, EMbase, Scopus, Web of Science, CABI, CINAHL, DOAJ, Index Medicus for Eastern Mediterranean Region-IMEMR, EMROMedex, High-Wire Press, and DARE ) and national databases (scientific information database (SID), IranMedex, and Magiran) were searched for MeSH terms ‘Hepatitis B,” “HBV,” and “Iran” and their Persian equivalents in titles and/or abstracts. All publications were recorded and categorized by the use of Endnote X3. The search results were subjected systematically to title and abstract screening. Then, qualified studies were obtained for full text screening. All potentially relevant publications were reviewed independently by two reviewers (MS-V and FS) for the eligibility criteria. Discrepancy between reviewers was resolved by consensus with an expert (SMA). In this study, blinding and task separation also were applied for study selection. All English or Persian observational (descriptive/analytical cross-sectional studies/surveys) studies on seroprevalence of HBV with clearly described time and location of the study, proper sampling strategies (findings could be generalized to general population), reliable laboratory techniques and proper analysis methods were considered to include in the present study. The exclusion criteria were (1) studies conducted as case reports, surveillance reports, letters or correspondence, and systematic reviews or meta-analyses; (2) overlapping studies; (3) studies performed exclusively on high-risk population groups; and (4) studies with non-serum-based HBV detection assay, such as saliva testing. After review of the full texts, the following data were extracted from each study: study characteristics (first author’s name, date of study, period of sample collection, and province or city of the study), participant characteristics (gender, age, population group, and sample size), HBV prevalence (HbsAg seroprevalence in all cases and HbsAg seroprevalence according to gender), and HBsAg detection methods. The quality of the included study was assessed using a modified STROBE checklist (19). Statistical analysis was done by Stata software, version 13 (Stata Corp, College Station, TX, USA). The prevalence of HBV was polled by the “metan” command and showed by a forest plot for the general population and also was based on both genders. 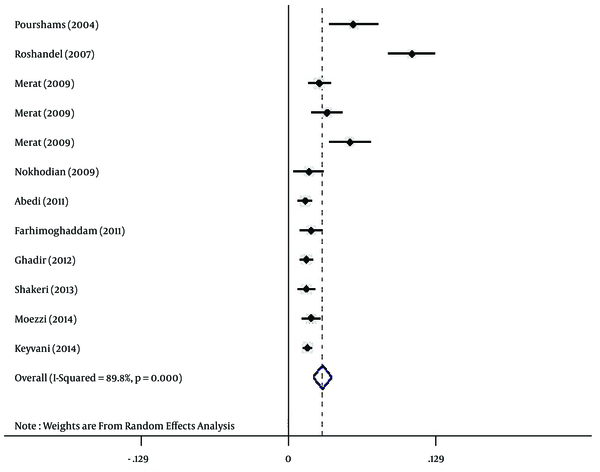 The random effect model was used for meta-analysis tests. 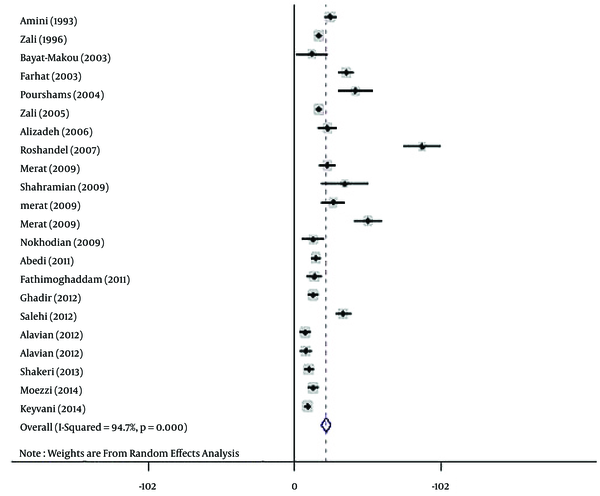 The forest plot as a graphic manner was used to show the effect size of all the studies with their confidence intervals and the results of the meta-analysis (20). Statistical heterogeneity was explored using the I-square at the 5% significance level. Meta-regression analysis was performed for determination of responsible factors for heterogeneity using the “metareg” command. 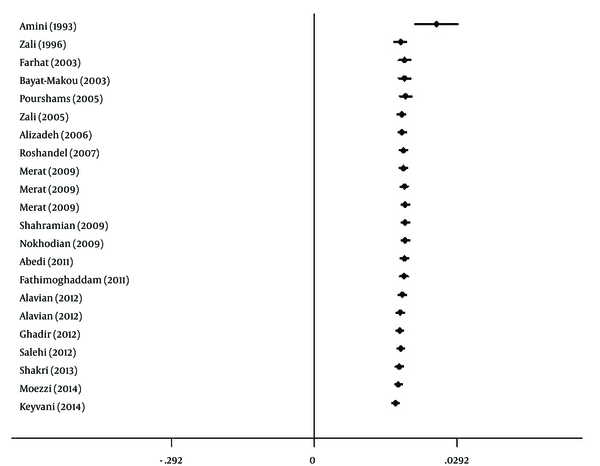 Publication bias was assessed by Begg’s and Egger’s tests (21, 22). To correct publication bias, the Trim and Filled method was used by the “metatrim” command. 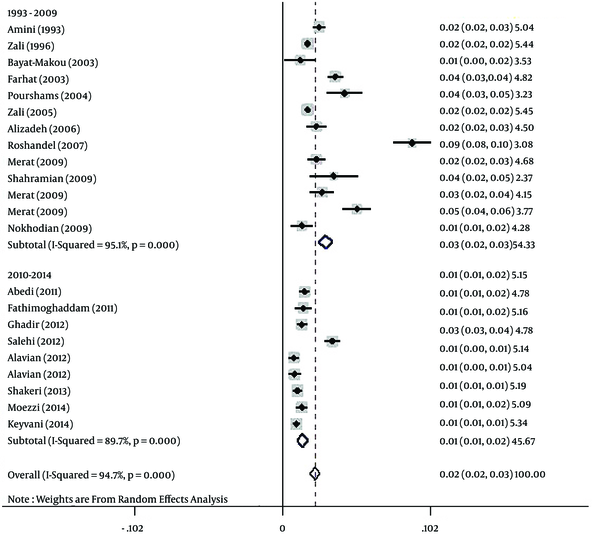 Cumulative meta-analysis based on the time was performed using the “metacum” command. Sensitivity analysis was performed using the “metainf” command. The prevalence of HBV was showed in geographic maps using Esri ArcMap GIS version 10.1. Following the removal of duplicates and primary screening, 40 publications were reviewed in full, of which 20 met the eligibility criteria and were included in the meta-analysis (Figure 1). Among 20 included studies, two studies (10, 11) were national, one study (year 2006) was conducted in Golestan, Hormozgan, and Tehran provinces (23), and 17 studies were regional (Table 1). Of the regional publications, two were from Golestan province, covering the years 2003 - 2006 (14, 24); two were from Hamadan province, covering the years 1998 - 2003 (12, 25); three were from Razavi Khorasan province, covering the years 1998 - 2011 (13, 26, 27); and two were from Sistan and Baluchestan province, covering the years 2008 - 2010 (28, 29). Other studies were from Charmahal and Bakhtiari (years 2012 - 2013) (30), East Azarbaijan (year 2001) (31), Isfahan (year 2006) (32), Kermanshah (year 2010) (33), Kordestan (year 2010) (34), Mazandaran (years 2008 - 2011) (35), Qom (year 2010) (36), and south Iran (years 2008 - 2009) (37). aThis study was conducted in Golestan, Hormozgan, and Tehran provinces. All included papers were cross-sectional studies. The sample size of the studies was between 381 and 46,631 and the age of study subjects was 1 - 100. Overall, most study subjects were females (Table 1). In all included studies, reliable commercial HbsAg ELISA kits were employed. The polled estimated prevalence of HBV infection in the general population of Iran from 1990 to 2016 was 2.2 % (95% CI: 1.9% - 2.6%) (Figure 2). The highest prevalence of HBV infection (8.9%, 95% CI: 7.6% - 10.2%) was reported from Golestan province (14), and the lowest prevalence (0.7%, 95% CI: 0.4% - 1.1%) was seen in Kermanshah province (33). Regarding HBV infection according to gender, the prevalence of HBV infection was estimated at 3% (95% CI: 2.2% - 3.8%) and 1.7% (95% CI: 1.2% - 2.3%) for Iranian males (Figure 3) and females (Figure 4), respectively. The results of the heterogeneity test indicated that the studies were significantly heterogeneous (P = 0.001), so the random model was used for polling the data. To determine responsible factors for heterogeneity, a meta-regression analysis was carried out. This analysis revealed that the time is responsible for heterogeneity. Therefore, a subgroup analysis and a cumulative meta-analysis based on the time were performed. In the subgroup analysis, the studies were divided into two different time periods, including before and after 2010. After subgroup analysis, heterogeneity was removed. The polled estimated prevalence of HBV infection in the general population of Iran was 2.9% (95% CI: 2.5% - 3.4%) before 2010 (1993 - 2009) and 1.3% (95% CI: 0.9% - 1.7%) after 2010 (2010 - 2014) (Figure 5). In the period before 2010, there were two studies with high HBV prevalence of 8.9% and 5.1% (23, 25). Therefore, we performed sensitivity analysis and estimated HBV prevalence in studies before 2010 with the exclusion of the two mentioned studies. After sensitivity analysis, the prevalence of HBV infection in this period decreased to 2.3% (95% CI: 2% - 2.7%), and overall estimated prevalence of HBV in the general population changed to 1.8% (95% CI: 1.6% - 2.1%). After performing cumulative meta-analysis, the prevalence of HBV showed a decrease from 2.5% in 1993 to 1.7% in 2014 (Figure 6). Based on the results of Begg’s and Egger’s tests for prevalence of HBV infection (P = 0.005 and P = 0.035, respectively), there was evidence of publication bias in the studies. Therefore, the Trim and Filled method was employed. Using this analysis, HBV prevalence in the general population of Iran was estimated as 2.2% (95% CI: 1.9% - 2.6%). The results indicated a significant difference within the geographic distribution of HBV infection in the general Iranian population (Table 1, Figure 7). 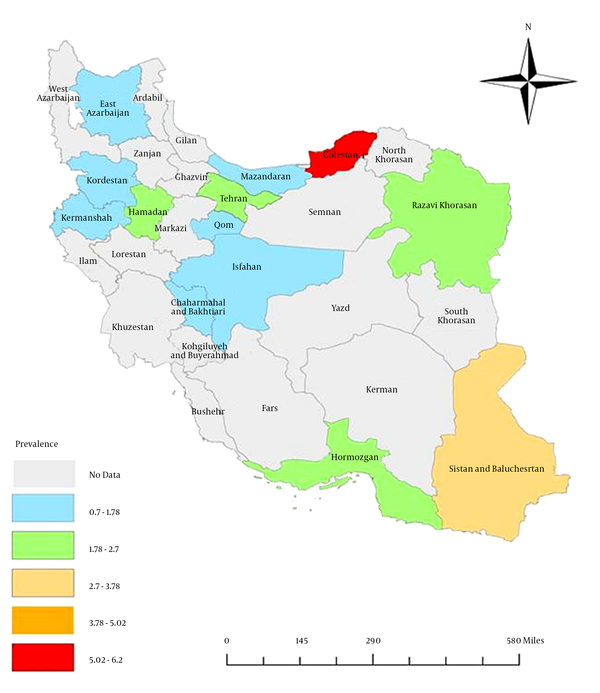 The highest prevalence (6.1%, 95% CI: 3.5% - 8.7%) was observed in Golestan province (in northeast Iran), followed by Sistan and Baluchestan province (3%, 95% CI: 2.3% - 3.7%), while the lowest prevalence was reported from Kermanshah (0.7%, 95% CI: 0.4% - 1.1%), Kordestan (0.8%, 95% CI: 0.4% - 1.2%), and Mazandaran (0.9%, 95% CI: 0.7% - 1.2%). HBV infection is a major public health problem and considered the leading cause of chronic liver disease in Iran (1, 38). In the last decade, HBV prevalence has reduced significantly in Iran (38) because of the infantile mass vaccination program started in 1993, enhancement of people’s awareness regarding HBV risk factors, vaccination of high-risk people, and the use of disposable syringes in vaccinations and clinical settings (39-43). Regardless of the present study, two previous systematic reviews have estimated the prevalence of HBV infection in the general population of Iran. Alavian et al. (16) conducted the first systematic review covering 14 studies from 2001 to 2007. They estimated that HBV prevalence in Iran had a rate of 2.14% (95% CI: 1.9% - 2.3%). In the second systematic review, covering six studies from 1998 to 2005 by Poorolajal et al. (17), the prevalence of HBV in the general Iranian population was estimated at a rate of 2.7% (95% CI: 2.2% - 3.1%). In the current study, to obtain an updated estimate of HBV prevalence in the general Iranian population, a comprehensive review of the literature covering the years 1993 - 2014 was performed. According to the results, the estimated prevalence of HBV infection in the general population of Iran was 2.2% (95% CI: 1.9% - 2.6%), a rate between the previous studies by Alavian et al. (16) and Poorolajal et al. (17). According to an implementation of preventive measurements, including vaccination programs in last two decades, it is expected that HBV prevalence will be reduced over time. In the present study, a notable decrease of HBV infection rate was observed within the data published in the period after 2010 (1.3%) compared to the data published in the period before 2010 (2.9%). It should be noted that, in the studies before 2010, there are two studies from Golestan province with the HBV prevalence of 8.9% and 5.1% (23, 25). Following sensitivity analysis and excluding the two studies from Golestan province (14, 23), the prevalence of HBV infection in the studies before 2010 and overall prevalence of HBV decreased to 2.3% (95% CI: 2% - 2.7%) and 1.8% (95% CI: 1.6% - 2.1%), respectively. Despite vaccination having reduced significantly the HBV prevalence and its complications, there are some concerns in this regards, as low efficacy of HBV immunization has been reported by several studies (44-48). Therefore, considering some revisions in HBV vaccination may be more helpful for prevention of HBV infection (49). In this study, the prevalence of HBV infection in males was higher than females (3% vs. 1.7%). This difference might be due to the frequency of more exposure to risk factors, such as occupational risk factors in Iranian males. Also, other risk factors, such as intravenous drug use, multi-partnership, and being shaved by common barbers, are more frequent in Iranian men compared to women (10, 14). There was heterogeneity in the geographic distribution of HBV infection and the range of HBV prevalence was extensive, spanning from 0.7% to 8.9%. This finding suggests that various parts of Iran may differ regarding possible risk factors of HBV infection, and extensive investigations should be performed to determine the geographic distribution of HBV risk factors (16). It should be noted that only two studies have examined the prevalence of HBV in the general Iranian population at a national level, and both were conducted before 2,000 (10, 11). Also, at a regional level, little is known about HBV prevalence in the general population in the majority of Iran’s provinces. Therefore, implementation of new studies at both the national and regional levels seems to be necessary to achieve real updated information on the HBV prevalence for improving the efficiency of interventions and prevention measurements. It is worth mentioning that occult HBV infection (patients seronegative for HBsAg but positive for HBV DNA) is very important in public health (50-52), as it has been evidenced that patients with this type of HBV infection are at increased risk of cirrhosis and hepatocellular carcinoma (HCC) (51, 53) and also for the risk of HBV transfusion transmission from HbsAg negative blood donors and management of bone marrow and organ transplantations (54, 55). Given that routine detection of HBV infection, which is based on the detection of HbsAg, cannot detect occult HBV infections, implementation of HBV DNA and screening should be considered in epidemiological studies (50). One of the strengths of the current study is that only studies that really were performed in the general population were included. However, the systematic review by Alavian et al. (16) included the studies on the general population, blood donors, patients on surgery, and students. Additionally, in the present review, well-designed studies form peer-reviewed journals with proper sampling strategies and reliable laboratory techniques were included. Another strength of this systematic review is that it is truly updated, as it covers studies published up to Jan. 1, 2016. The present systematic review has some limitations. Iranian national databases are not functional enough because of the insufficiency of search tools, absence of user-friendly advanced search tools, and limited coverage of all national scientific journals, universities research projects, and dissertations. Another major limitation was applying standard keywords for search in Iranian national databases. To solve this problem, all synonyms of standard keywords in both Persian and English languages were subjected to search. According to all data on the prevalence of HBV in the general population reviewed in this study, Iran was classified within the low–intermediate HBV prevalence areas (2% - 4.99%), while according to recent data (after 2010), Iran is classified within the low HBV prevalence areas (< 2%), indicating that preventive measures conducted in Iran were effective. There is a heterogeneous pattern of distribution of HBV infection between Iran’s provinces, indicating the necessity of continuous prevention and control measurements and the implementation of further epidemiologic studies for collecting reliable data on HBV prevalence in different parts of Iran.